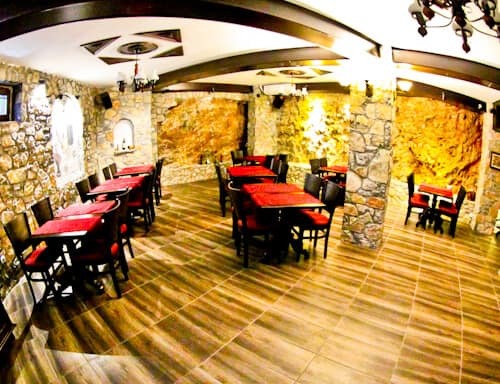 For a true Macedonian experience in Ohrid, I recommend the Vila Mal Sveti Kliment. Visit the Vila Mal Sveti Kliment website for the best room rates. For the latest events and pictures check the Facebook and Instagram feeds. To contact the hotel quickly, I recommend Facebook Messenger. Vila Mal Sveti Kliment hotel is located in the old town and offers views of Ohrid Lake. It’s a short 200 meter walk to the lake. The location is peaceful as it’s pedestrianized. If you’re arriving by car, parking is available lakeside. 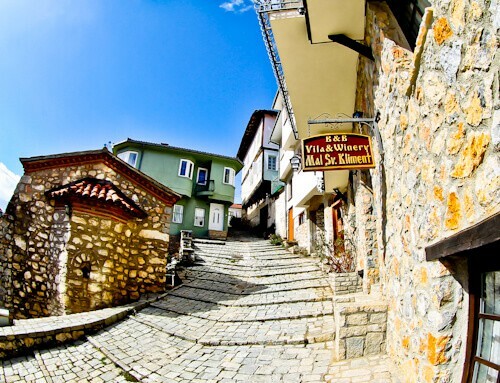 Ohrid is a small town and you can walk to all the major points of interest such as the Fortress, Church and Roman Theater. Additionally there are lots of restaurants nearby. The winery is located onsite, so you will not need to walk far for a glass of Macedonian wine. When you enter the premises you’ll pass an interesting mosaic. 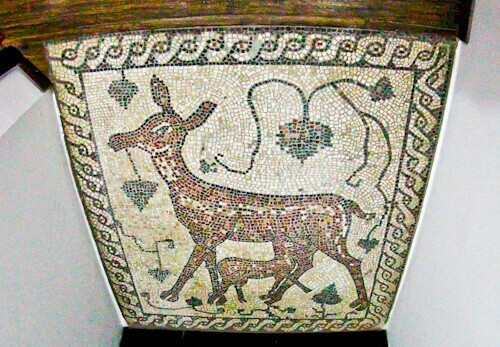 This is a replica of a mosaic from the ancient Greek city of Heraclea Lyncestis in Bitola. You can ask at reception about day trips to see these mosaics. In addition to this day trip, you can also organize boat trips on the UNESCO Ohrid lake. During the check in process, the friendly staff will invite you to the winery for a complimentary glass of wine. In fact, for true wine lovers, you can organize a trip to the local vineyards. 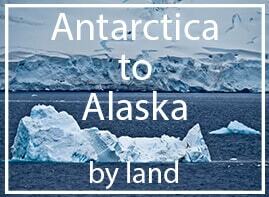 During the winter months the rooms are heated by an underfloor heating system. In the summer months you can control the temperature with the air conditioning unit. 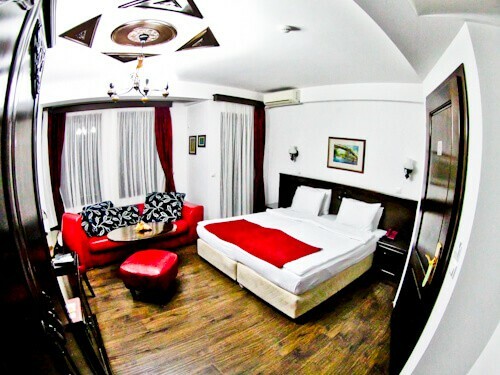 A notable feature of the guest rooms are DVD players and a large selection of DVD’s. If you wish to relax in the room for the evening, you won’t have a problem finding a suitable DVD. In addition, you could arrange with the hotel beforehand to have your desired DVD to be part of the the selection. As well as DVD’s to keep you occupied, the hotels complimentary WiFi extends to the guest rooms. The view of the UNESCO Ohrid lake from the room is stunning. The lake is huge and looks like a sea. If you’re visiting during winter, the mountains in the distance will be covered in snow. The other side of the lake is in fact part of Albania. Boat tours of the lake can be organized at reception. You can witness a beautiful sunset over the lake from the balcony. The sunset is best complimented with a glass of Macedonian wine. The complimentary breakfast buffet consists of sufficient fresh food to give you the energy for your days activities. In addition you have tea, coffee and juice. Wine is not part of the breakfast buffet but there’s no harm in asking! Later in the day however, the breakfast room is where the wine is served. In addition to the hotel and winery, the company also has local vineyards. They bring the grapes to the winery and the wine making process is carried out on site. If you’re lucky you’ll be able to witness the wine making process yourself. If not, there’s a DVD the staff will be happy to play for you. Whenever you visit, you’ll be able to enjoy a glass of wine – the finished article! 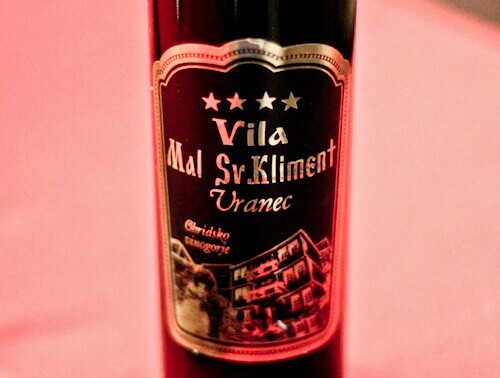 The brand of the wine is Vila Mal Sveti Kliment (above). While you are staying at the winery you’ll be able to sample several different types of wine. In addition, it will be explained which type of grape was used and from which region it came. There is more information on the different Macedonian wines available on the hotel web page. 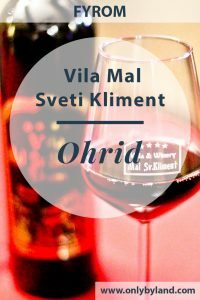 Why the name, Vila Mal Sveti Kliment? 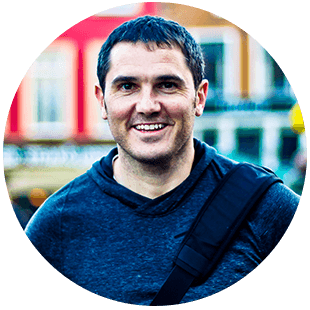 The B&B got it’s name from the neighboring church, Mal Sveti Kliment. If you choose a budget room at the property you’ll have a view of the church. This is not a bad second best to the UNESCO lake! 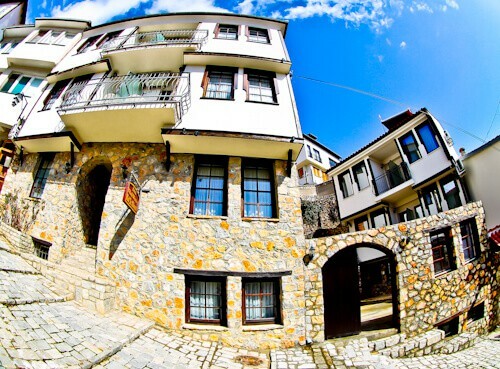 Enjoy the location in the center of the old town of Ohrid. 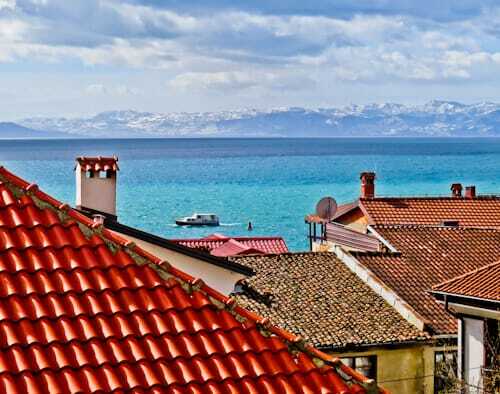 More importantly, book a room with balcony view of the UNESCO lake Ohrid. 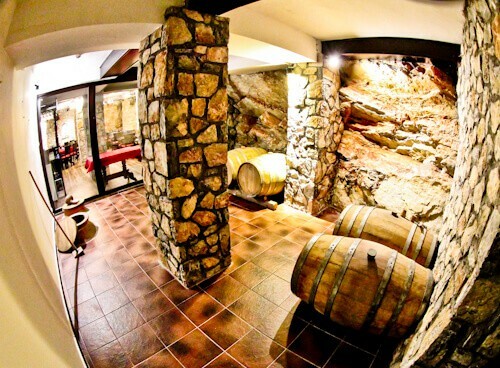 Be sure to visit the winery, you’ll learn a lot about Macedonia wines and the different regions. Visit the Vila Mal Sveti Kliment website for the best room rates. For the latest events and pictures check the Facebook and Instagram feeds. To contact the hotel quickly, I recommend Facebook Messenger. This hotel really find my weakness. I could not live without wine and the complimentary class of wine and the onsite winery is very tempting, although I wont start my morning with wine through.